This applies to both personal narrative and fictional narrative writing. With personal narratives, students give way too much information about parts of the story that don’t really matter and glaze over the most important details. Often students will begin their personal narrative by telling the reader they woke up. Not really a significant detail about a day at the beach. A fictional narrative can be similar. Young writers have a difficult time keeping their imagination focused and make-believe stories often go down a rabbit hole and can spiral out of control. We need to help our students figure out the MOST important information related to their experience they want to share. 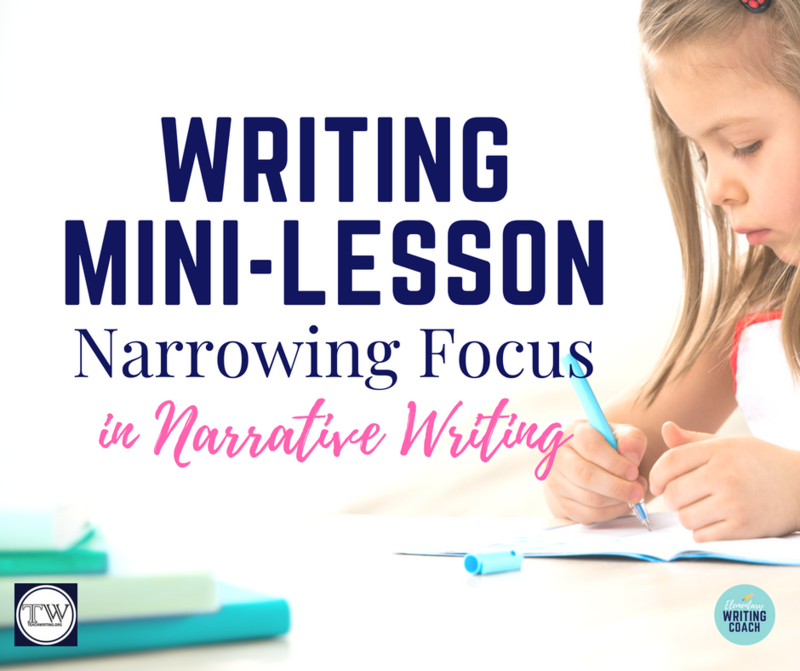 This mini-lesson is a great pre-writing activity to do at the beginning of a personal narrative or fictional narrative writing assignment. This process will take a broad student topic (like a favorite trip) and narrow the focus to one topic filled with only the most important details. First, let’s pretend students are writing about their favorite thing they did this summer. Start with a traditional Brainstorm. Brainstorm everything they did this summer. I like to set a timer to keep them writing. I only set the timer for 2 minutes. After 2 minutes I let the kids share out some of their ideas. If your class needs more time, you can add another minute, otherwise, move on to step 2. Next, students do what I like to call “Focus Storm.” They choose 1 thing from the brainstorm that they want to focus on and we now do a Focus Storm. A Focus Storm is similar to a brainstorm. They write their new topic in the middle and they write as many details as they can about the topic. ***Tip: if their topic is still too broad, they may need to do another brainstorm with their new topic to narrow their focus down even more. See my sample. For instance, on my sample, my initial brainstorm about my favorite thing I did this summer ended with a trip to San Diego. A trip to San Diego is still a broad topic, so I will take San Diego and write it in the middle and do another Brainstorm to list ALL the things I did in San Diego. 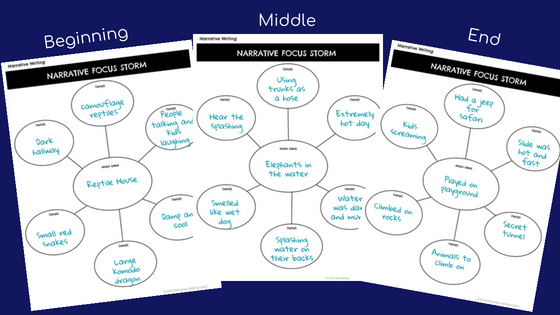 Now I can choose one of the brainstorm topics (here, I chose a trip to the zoo) and do another Focus Storm. Do you see how it keeps narrowing and narrowing the focus until I only focus on the three main events during my trip to the zoo? 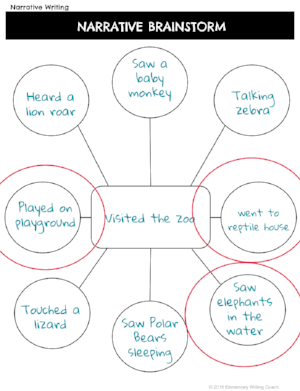 I took a “trip to the zoo” and I listed as many details as possible about what I did there. It is important that students come up with at least 3 details here because these three details will become each of their three main events. Next, choose 3 main events from the Focus Storm. These should be three things they feel comfortable giving lots of ideas about (think 5-senses). The three main events will become the beginning, middle, and end of their story. Finally, students create a Focus Storm for each of these 3 topics. For my example, I will have a Focus Storm on going to the Reptile House, seeing elephants in the water, and playing on the playground. When students do these focus storms, I tell them to try to include 5-sense descriptive details (what did they see, hear, feel, smell, taste). Tip: Try to set a timer for each of the brainstorms and focus storms. It creates a sense of urgency and kids will usually stay more focused on writing and quickly think of ideas. Since this is a prewriting activity we want to get ideas out as quickly as possible. DO NOT worry about spelling, grammar, punctuation, or even writing complete sentences. Just get the ideas out quickly! This helps to flush out all the details and narrow the focus. Now students have their 3 main events (related to their main idea topic) and details. This also works great for a fictional narrative, especially when little imaginations run wild! Let’s pretend they are writing to a prompt about waking up as an animal. What do they do now? First, they should create a brainstorm about all the animals they would like to wake up and become. Next, after they choose their animal, they should create a focus storm about all the things they would potentially do if they woke up as this animal. This focus storm usually gets crazy as little minds get more and more creative with ideas. Once they have a lot of ideas, students should only choose three events from their list that they want to go more in-depth with (these will be the beginning, middle, and end of their story). Finally, students will create a focus storm for each of these three events. Reduces the time students spend writing about waking up or driving to a place. Instead, they get started in the action! Vets out bad topics quickly. If they can’t think of anything to include in a brainstorm or focus storm, they may need to choose a new topic that they know more about. Once they have all the details, they can focus more on elaborating on those details. Helps the drafting phase go so much quicker because students have already flushed out all their ideas. Let me know if you have any strategies that you like to use in your classroom to help your students narrow their focus and start to organize information! Join the TeachWriting.org Newsletter to get access to our Free Writing Resources! I’m Whitney Ebert, founder of ElementaryWritingCoach.com. As you may have guessed, teaching young authors to develop their craft and feel confident in their writing skills is kind of my thing. I have 10+ years teaching experience in elementary education, and I've taught every grade level from kindergarten to sixth grade (except first). My teaching passions include interest-based learning, creative technology, project based learning, and building confident writers. Additionally, I have my M.S. in Instructional Media, so I frequently incorporate digital flare into projects and writing assignments. I live in a sunny beach town with my husband, preschooler and baby. When I'm not teaching, blogging, or designing new lesson plans, you can find me at the beach with the family.